Ubisoft have appointed a new Chief Parkour Officer. Rather than promote a fleet-footed executive from within, they’ve hired on noted freerunner Michael ‘Frosti’ Zernow. He’ll advise on the imminent Assassin’s Creed Unity. “I’ve been a long-time fan of the Assassin’s Creed franchise, and it’s one of the few highly visible examples of parkour that attracts younger athletes to the sport every year,” said Zernow of his role. Zernow will ensure that the parkour sections of upcoming Ubisoft games like Assassin’s Creed Unity are up to scratch, and instruct the publisher on how best to support the sport. “Ubisoft’s new Chief Parkour Officer will serve in a strategic advisory role, ensuring an ongoing commitment to the authenticity and accuracy of parkour beginning with the October 28 launch of Assassin’s Creed Unity, the next installment of the 76 million unit-selling Assassin’s Creed franchise,” said the publisher. Zernow has contributed to Assassin’s Creed games in the past as part of Ubisoft’s motion capture team. Elsewhere, he has coached at California’s Tempest Freerunning Academy and turned heads on US TV shows Survivor, Jump City: Seattle and American Ninja Warrior. We commend the silliness of Zernow’s job title, and look forward to his contributions to Ubisoft’s next quarterly earnings call. Did you see the most recent Assassin’s Creed Unity trailer? It seems Ubi Montreal have finally cracked the art of climbing down from buildings without resorting to haystacks. And this new protagonist is different – hurling himself along the side of cathedrals with what reads like arrogance. 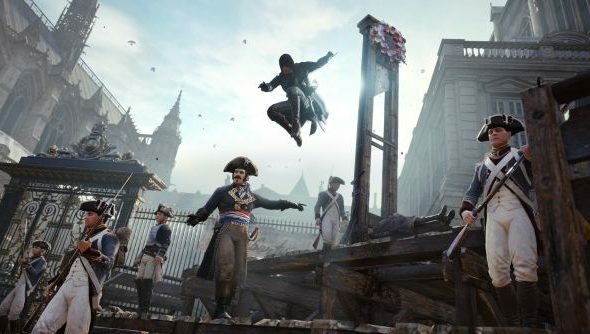 Does Assassin’s Creed Unity have you excited about parkour again?